Family recipes may be my favorite recipes ever! My grandma passed down this recipe to me. I am not sure where she got it from, but it made into one of her two GIANT cookbooks she gave me when I went to college. Both she and my mom make this marinade all the time, because really, it is SO easy AND tastes amazing! I like to credit its amazing flavor to the 7-Up :) Now that we finally have a grill, I make it all the time for a quick, easy and delicious dinner. An easy and delicious marinade that is jam-packed with amazing flavor! Trim Chicken and poke holes with fork. Place chicken in a 9x13 and pour marinade over top and cover. Place in fridge. Grill chicken and eat up! How much chicken do you normally marinate with this? I did four large chicken breasts in mine because that is what would fit in my 9x13. You could probably get 5-6 normal sized chicken breasts into the 9x13. YES!! This is amazing. My mom used a variant of this (no horseradish, but added salt and pepper) and it was awesome! It's also great on beef, as well! Would this work with diet/sugar free 7 Up? I love your recipes - so easy and delicious!! Thank you for posting all of them!! With this one, could you also cook the chicken in the oven after you've marinated it, instead of grilling it?? I love all of those ingredients. Sound delicious! sounds amazing but it seems like a lot of oil. do you think it would work with less? I only have diet 7-up, BUT I do have a 2-liter bottle of Mountain Dew that I bought to kill some wasps without chemicals (thanks, guy at Home Depot). So . . . I am going to use that and see how it turns out! let me know how the Mt. Dew works out! oh man - you keep adding to my recipe try to do list! this sound super yummy! Could you substitute sprite for the 7Up? I am sure you could! Let me know how it turns out for yoU! Looks delish!! I am pinning this! I've NEVER used horseradish in any recipe and have no idea if my family or I will like it. Can I leave it out and still have great tasting chicken? Or was the "optional" message just for the brand? I use 7-up or sprite when I marinate my meat. (pork or chicken). I put soy sauce, vinegar, sugar, salt and pepper, garlic and a little bit of canola oil. It's my family's favorite marinate recipe. When I didn't have 7-up or sprite I used Dr Pepper and it tasted really good, too! We couldn't tell the difference. This recipe is absolutely mouth-watering Nikki! I'm going to have to try this ASAP! My family loved this chicken recipe. The flavor was delicious. I was a little worried that it might be too sweet with the 7-Up, but it wasn't at all. 4/4 of us liked this recipe and asked me to keep it on the remake list. Thanks again for another great recipe. I am going to try the 7up marinade, but need to know how to scale the ingredients for 9 chicken breasts. I don't have 7up but I will try coke or ginger ale with this recipe. Will let you know how it turns out! Thanks! I made a few minor changes and turned out fantastic! 1) I had frozen Kroger Breasts - left them out for 5 hours and then made the marinade the night before. 2) In the morning - I took out the Chickens and used a fork to poke holes. 4) I used a 2.5 Gallon bag to store everything in - not a pan. 6) We love Hoisan sauce! I put in 2 TBSP. Hoisan gives you that Salty / Sweet look the recipe calls for. 7) I had so much chicken I multiplied every quantity by 1.5. 8) The left over marinade went in to a cup and I constantly basted with it while on the grill. All printed out on my way to grocery store.. I have never used Horseradish in a recipe ... does it make the meat spicy or hot like plain horseradish is. This is awesome!!! I have never left a review for any recipe but I wanted to share with everyone how great this is!! Try it, you will not be sorry!!! How much chicken does this 7-Up Marinade Recipe cover? Thank you. Can the 7-Up Marinade be used to bake chicken instead of grilling it? Instead of grilling can you bake the chicken? And if so for how long? Can you bake instead of grilling? Also if you bake it for how long and what temperature? I used Squirt because that was all I had - no 7up. It was delicious. Even my picky eaters loved it. Thank you! Loved the recipe!!! the 7-up marinade does not mention how many chicken breasts? i'm guessing 4? please advise. thank you! I was out of 7-up but I have a Soda Stream machine & I had lemon lime syrup...so I used that soda it was still perfect. Are you using boneless, skinless chicken breasts? This also makes an awesome stir-fry sauce -- just leave off the horseradish. MY mom's variation of this is 7up, soy sauce, and zesty italian dressing. 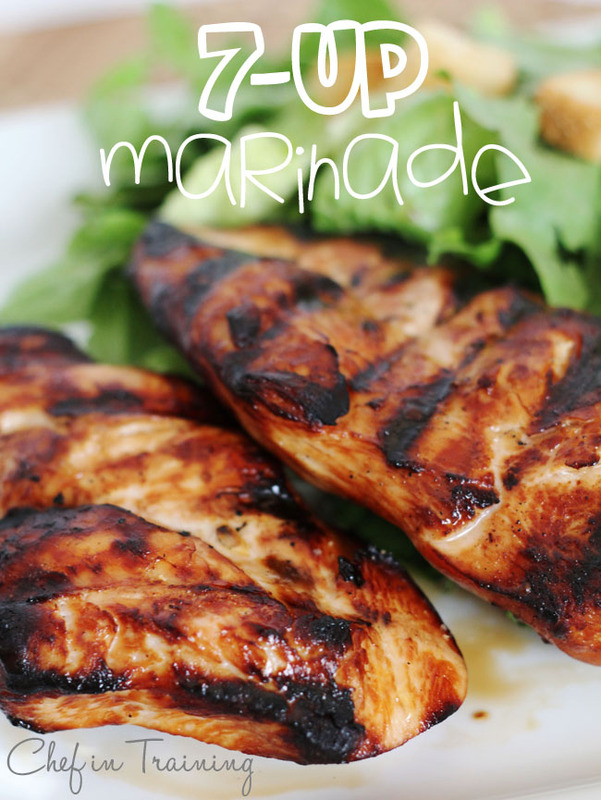 Definately my favorite grilled chicken marinade!! I actually usually leave out the 7 up. Is this the 7 Up soda drink you talking about? Is the carbonation in the drink a main effect in the marinade, or would I be able to make a lemon lime sugar water mixture and use that? I am SO late to this party, but this recipe originated in Manti, Utah by the turkey farms! How many chicken breast does it call for? Can you bake instead of grill? Thank you!! This sounds so good! Will be trying it soon. I made this last night and did not care for it. Very salty - too much soy for my liking. What would be a good substitute for horse radish plz? And would this recipe work for whole chicken divided into 4 quarters?